A mathematical function such as a translation, rotation, scaling, or shearing that transforms a line into a line or a plane into another plane. Using a trick, such functions, which are usually difficult to combine due to the nonlinear behavior of the translation, can be implemented with just one matrix multiplication: the number of coordinates is increased by one, so-called homogenous coordinates are used (see also below). Although the rendering of trees requires a relatively small number of compo­nents, experience with the system is necessary. Thus, we suggest to first model a small flower. The final result was used for the interactive rendering of plants and can be seen in Fig. A.3. 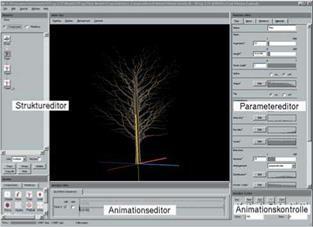 The description given here refers to the Xfrog Version 3.5, for the Version 4.0, which is integrated in Cinema4D, slightly dif­ferent components are used. After starting the program, a leaf component from the area at the lower left in the modeling environment is selected by double clicking. After it appears in the structure editor, it will be connected with the camera. The description for the structure and the view of the geometry are seen in Fig. A.4. The web site to this book, found at “www. computerpflanzen. de” contains use­ful information, links to a collection of programs, and data and video sequences. Most of the content is related to our modeling system “Xfrog” which also can be downloaded there in a demo version usable with full functionality for 30 days. In the following, a practical introduction to modeling is given, which should help the reader create plants and other objects by him-/herself. The basis of the program was designed in 1998 by the authors. During the years following, in cooperation with different coworkers and with generous support from the Intel Corporation and the ZKM Center for Media Arts and Technology, Karlsruhe, the program was further developed. SonoMorphis is an installation with genetic graphics and sound, developed by Torsten Belschner and one of the authors (Bernd Lintermann). A first version without sound was developed between 1995 and 1997, and extended to in­clude sound in 1998 in co-operation with the audio designer Torsten Belschner at the ZKM Karlsruhe. The goal was to develop an audiovisual instrument that is varied and flexible enough to react exactly and in a nuanced way to the sound of an instrumentalist. The range of possibilities should be such that an expres­sive, variable, and complex play develops. Thomas Ray’s goal is an independent evolution of computer programs with as few defaults from the outside as possible. In a technical environment, in which the only goal of programs is their own reproduction, and only limited system resources such as processor time and storage location are available, accord­ing to Ray’s view, programs will develop independently into complex problem solutions, which can be observed by humans and used for our purposes. An as­sumption with regard to the kind of the developing programs cannot be made, since evolution leads to new solutions that exceed our imaginative power. Thus, only pure principles of evolution are permissible, like self-reproduction and “natural” selection with a system-inherent fitness function. This work originated in 1992/93 as the first joint work of the two artists. It was shown world-wide and also was part of the permanent exhibition of the ZKM Media Museum in Karlsruhe. The viewer enters a dark area of 6×7.5 meters, into which five platforms with five different plants face a 4×3 meters-large projection in a semicircle. If the visitor comes close to a plant or touches it, then different virtual plants grow in the projection. 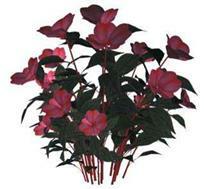 Each real plant is assigned a type of a virtual plant. With each interaction the screen fills more and more, and one ends with a jungle of ferns, grasses and mosses. Using a cactus that functions as an eraser, the viewer can wipe the screen again. Several visitors can thus generate a virtual garden together at the same time. While for Karl Sims evolutionary techniques are a means for obtaining com­plex, nonplannable visual results, for Christa Sommerer and Laurent Mignon­neau the algorithmic creativity of evolution stands in the foreground. The vari­ety of organisms, which nature brought about in the course of evolution, serves as an indication of the creative potential for technically realized evolutionary processes in the arts. If the principles that cause the wealth of organisms in nature are used as much as possible, then the machine turns into a work of art, which does not produce final results in interactions with the viewer, but, instead, during a continuous process again and again produces new interesting conditions, and therein first develops as art: “art as a living system” .